SERIOUS Investing: IHH IPO: Where's the beef? There is no doubt that private healthcare is a fast growing industry. The IHH IPO, it seems has no problem getting institutional funds to take up as apparently 62% of the shares on offer are to be taken up by cornerstone investors. These cornerstone investors will be disallowed from selling their shares for six months after the listing takes place. Among the cornerstones, EPF (8%) and Kuwait Investment Authority (6%) will be taking up more than 5%, while 20 others (including Blackrock, Singapore GIC) will be securing less than 5%. Besides the shares held by the substantial shareholders including Khazanah, Mitsui, Abraaj Capital and the Adlinyar family (who originally controlled the Acibadem group), with the majority portion taken up by cornerstone investors, only 8.81% will be offered to retail which over here includes MITI tranche. On top of that, CIMB will be the stabilization manager for this issue. Hence, for the first half of the year, the transacted portion will be very much controlled. Unless something unforeseen crop up, I do not see any reason for deterioration in prices below the offered price for the first few months. Hence, whoever that are offered pink (staffs) or blue (partners, doctors) forms etc, do take up. Now we know that it is easy for the controlling shareholder to support the share price due to the low tradeable portion, how about its valuation? Is IHH worth it in the long run as an investment? Also what makes the cornerstone investors commit themselves? If you look at the above proforma income, the one that came into notice is the first quarter 2012 results. There is no doubt that IHH is selling the first quarter and its prospective earnings from 2012 onward rather than focusing on the previous years income. This is how they are pricing the IPO at RM20 to RM23 billion. My question however is even if we forecast the full year income for 2012 at RM700 million i..e the top end of expectations, its prospective PE for 2012 will still be between 30x to 33x. Note that IHH will need good results for the full year 2012, before the lock up period for the cornerstones are up. If however we based the valuation on 2011 income, even if we are to discount the Euro and US Dollar financing losses for Acibadem totalling RM350 million, the total group profit would have come at RM483 million. On that, the pricing of RM23 billion would have valued IHH at 47.6x PE. Is there anymore room for growth with this kind of pricing? If anyone is saying that one should not look at the NTA, then they are dead wrong. Hospitals are property and capex investments due to its high capital expenditure involved. To really decipher how profitable the investments are, one should look at the speed of its investments return. Hence, it is important to see whether the group has invested too much in order to grow or their balance sheet position is just nice. As you can see below, IHH has no doubt needed this IPO as they are quite highly in debt. They needed the fund raising to reduce the debt level of the group. 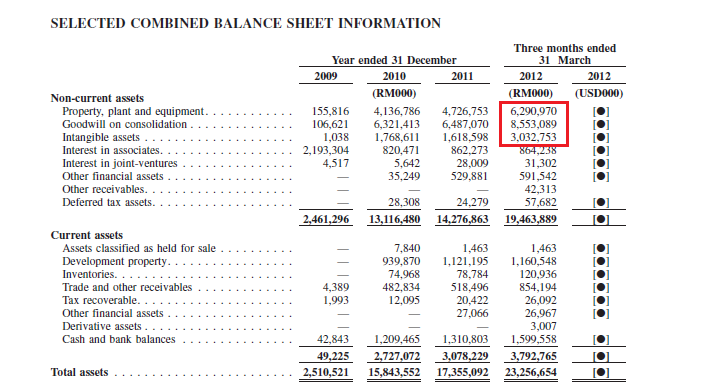 I have actually split the balance sheet into 2 sections: (1) asset and (2) liabilities and equity. There is no doubt that the more than RM5.3 billion to be raised from the IPO would have improved the balance sheet of the company. Now, I realize why Khazanah needs to rush this IPO as they have plans to open more hospitals in a hurry and its current balance sheet is not providing the right position to gear further. If you notice, the IPO is offered at a proforma Price / NTA of more than 5x, which is high. There is no doubt due to many factors such as pricing elasticity of private hospitals, medical tourism, greying communities and societies need for better healthcare, private healthcare is a good business. Over the last few years, private healthcare has registered more than average growth. For IHH, this is especially strong when it is one of the largest group in the world. IHH can make use of the brand to do tie ups. Brands that it carries such as the Acibadem and Gleneagles can be expanded. Now, with this what is the take? While I like the business, the valuation that's being asked is way too expensive for me to digest. I am not too comfortable with the way Khazanah piecing up the individual groups over last 3 years and promote them as one of the largest private healthcare group in the world either, as some things are better off with organic growth than building them like "Lego" blocks. Notice the original Parkway management on the Board despite it becoming largely a Malaysian controlled company. This also shows that the IHH group is desperately in need of managers to manage this business as they have only knew how to buy businesses at very high price but to manage them, Khazanah probably needed Parkway. Can Parkway deliver - this is the question? Let's wait and see. Another thing to note, Parkway was just valued at RM5.2 billion in 2008. Less than 4 years later, with the addition of 60% of Acibadem, 60% of Pantai and 100% of the IMU, Khazanah is selling at RM23 billion post IPO. You might want to ask, has the industry improved so much over the last 4 years? IHH will be one of the largest listed private healthcare providers in the world based on market capitalisation upon Listing. It focuses on markets in Asia and in the CEEMENA region, which are highly attractive growth markets. IHH operates an integrated healthcare business and related services which have leading market positions in our home markets of Singapore, Malaysia and Turkey, and we also have healthcare operations and investments in the PRC, India, Hong Kong, Vietnam, Macedonia and Brunei. Its global healthcare network operates over 4,900 licensed beds in 30 hospitals and has one other hospital in Turkey, the acquisition of which is pending completion, as well as medical centres, clinics and ancillary healthcare businesses across eight countries. In addition, it has over 3,300 new beds in the pipeline to be delivered through new hospital developments and expansion of our existing facilities over the next five years, which includes two potential hospital development projects in Turkey. These new beds in the pipeline also include approximately 760 new beds in those facilities which it expects to manage through HMAs, over the next five years. As at 31 March 2012, it employs more than 24,000 people worldwide. IHH's core businesses are operated through its key operating subsidiaries, namely PPL, Acibadem Holding and IMU Health. Will IHH follow FGVH in clocking a cool premium on its first day? IHH: Who will make the most from this IPO? But Im still thinking to apply this IPO and earn some profit. It is going to be tough as there are only 160 million shares on offer for the public. can you show your calculation for the P/E? Maybe i'm calc it wrongly. Market price per share = 2.85 per share. P/E = 2.85/0.11 = 24.80? I believe you are referring to historical 2011 PE. There are 2 ways of calculating PE. First - as what you have done Price / Earnings per share. In your total shares I think you have gotten some part wrong. 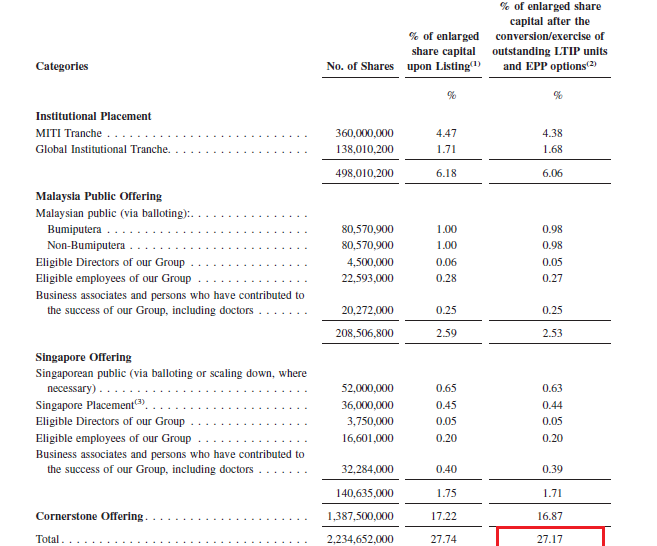 The total shares should also include the ones that the original shareholders have i.e. Khazanah, Acibadem original shareholders, Abraaj. I think the total shares is slightly more than 8 billion units. Second way to calculate PE is easier - Market Capitalisation / Total Earnings. 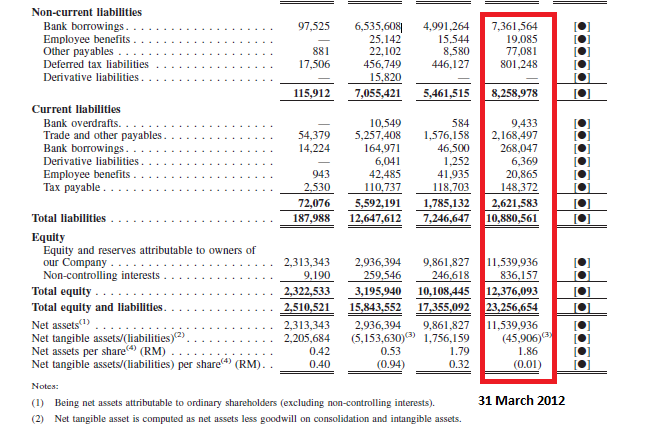 In my calculation RM23 billion (post listing) / RM483 million which comes to about 47x PE historical. however I think IHH is very much looking towards future earnings but the historical is a guide. I am not so sure they can achieve what they think can achieve which is around RM800 million this year i.e. what they have told investors. Even if they achieve RM800 million Net Profit, it is still quite expensive. Hence, Where's the beef? You get all the carbo but no protein? Agreed. I also do think that it's hard to achieve a high growth as they still expanding and have high investment..